As I have delved into writing more over the past several months I have noticed a certain, disturbing tendency in myself. Once I became aware of it I began to notice in other writers as well. It is the propensity to write for reaction rather than writing for effect. It is the desire to have readers react strongly rather than to have than changed meaningfully. It exhibits itself in both how a writer picks the subject and how he communicates it. Am I trying to say something that matters or something that sparks a pointed response? Am I writing it in such a way as to spur action or feeling, or am I trying to provoke for the sake of provocation? The Tim Tebow furor is a perfect example of the negative aspects of this, the writing for reaction. 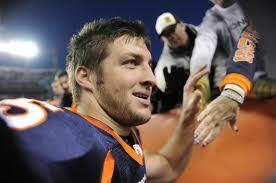 Writers, Christian and otherwise, have spewed opinions all over the internet about Tebow and his overt faith in Jesus. But to what end? It seems like a lot of provocation for the sake of garnering response rather than proclamation for the sake of effect on the reader. Both the choice of subject matter (Tebow) and the method of communication (arrogant, pointed, judgmental, hateful, defensive, etc.) are fuel for a reaction but not necessarily conducive to a meaningful effect. This tendency isn’t any more prevalent in Christian writers than others, but it is far more disturbing. I expect there to be shock jocks in all mediums of communication and coming from all view-points. But I abhor Christian shock-jockery. I’m not even sure that phrase “Christian shock jock” makes sense. It so implies the pursuit of a strong reaction that it almost necessarily excludes the desire for a life-adjusting effect, but it is the effect, the change, that all Christian communicators should be pursuing. This isn’t so say beliefs and opinions can’t be expressed in pointed, even shocking ways. But shock and reaction cannot be the aim; rather they must be the means to a change. Jesus talked about cutting off one’s hand to resist temptation and millstones tied to the neck of tempers to drown them. But he spoke these words that his listeners might have life and have it to the full, not that they might have a strong reaction and leave pointed comments on his blog. And it should be that same intention with which all Christian writers write; that our readers might have life and have it to the full. May our tidbits of wisdom and perspective be aimed at an effect on our readership, not a reaction from them.